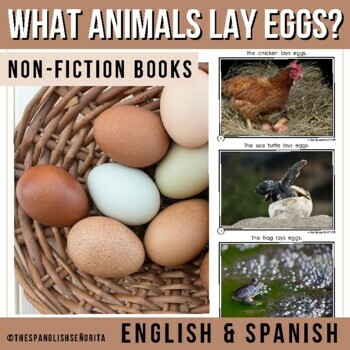 Non-Fiction Spanish Reader ¿Qué animales ponen huevos? - What animals lays eggs? 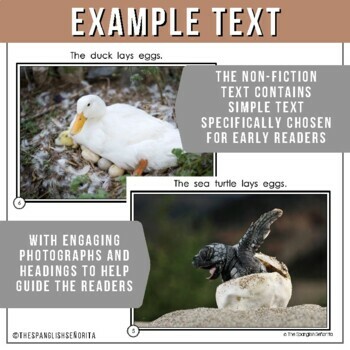 Teaching Tip:These Spanish Non-Fiction Readers were created to build student background knowledge and vocabulary, while maintaining simple easy-to-follow text for readers beginning to read. Each reader contains 9 - 12 pages of non-fiction text, features including a title page, author, real photographs, and page numbers. 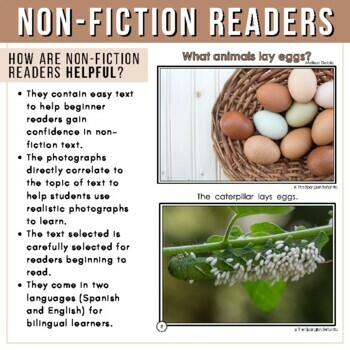 This is a PATTERN non-fiction book that can be included in your guided-reading collections, classroom library, read-alouds, or simply to teach students more about non-fiction or informational texts. An example of the pattern is, "El cocodrilo pone huevos. 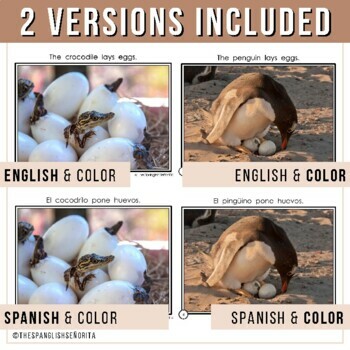 El pingüino pone huevos." Thank you for purchasing this themed Non-Fiction Spanish Reader. Please know that you obtain a single user license. If you wish to share this book with others, please purchase additional licenses as the copyright to this book belongs to The Spanglish Señorita. If you have any questions regarding this product or others, please contact me.